Ev and I were all set to hit up our favorite scootering/walking path this morning. We usually park by Hotel Bellwether, then walk around to the playground and back. When we left the house this morning, it was just starting to sprinkle and by the time we took the girls to school and parked, it was absolutely pouring. I wasn’t expecting such a downpour and didn’t bring rain coats, just fleece. I think we were both feeling weary about taking such a long walk in the rain, so when I suggested we go to Perch & Play instead, he jumped at the chance. We chickened out, ran home to grab my work stuff (actually, twice, because I forgot to get him socks, too!) and now we’re happily playing and working, out of the rain. How are you spending this rainy (almost) summer day? 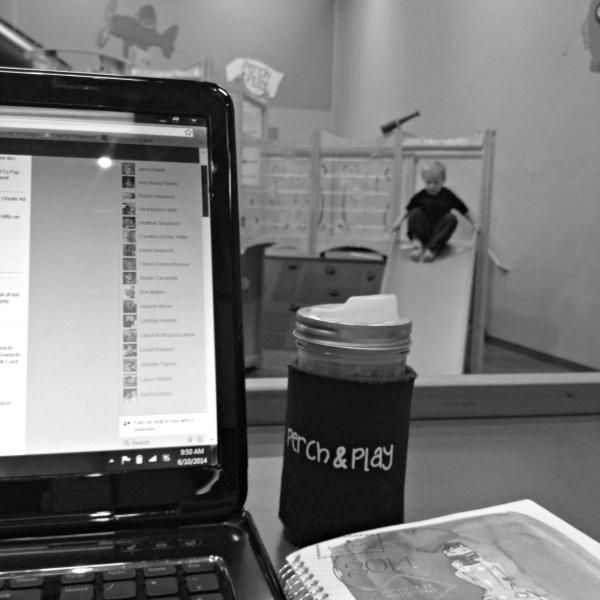 This entry was posted in Life and tagged 2014, Perch & Play, Rainy Day Fun on June 10, 2014 by Katie Kavulla. That’s the perfect rainy day place! We are hunkering down to tidy up the house this morning so that we can go north for pool fun at Watermania + yummy Chinese food for dinner in Richmond, BC later today. That sounds like a perfect morning, Jess! And a very fun afternoon! Rainy days are the best for Chinese food!